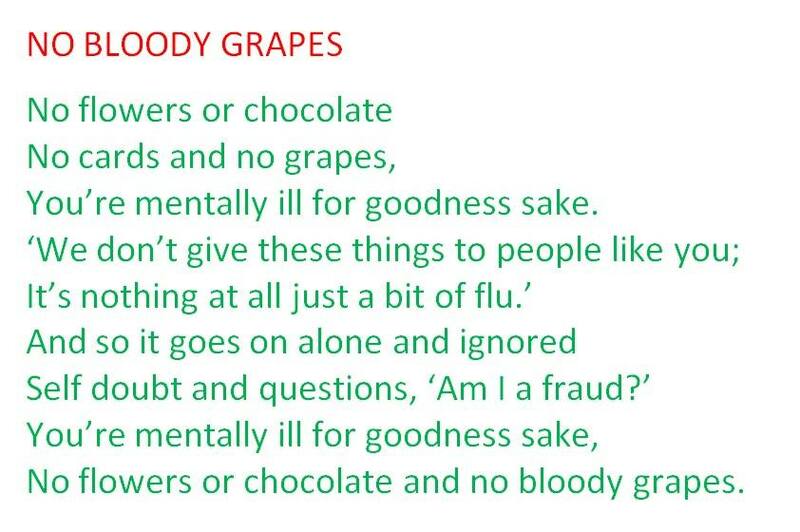 The poem above was recently posted on the Facebook page for the mental health charity SANE, by Michael, a supporter of the charity. It’s about the differences in how people react to mental and physical illness. I think it makes the point briefly but powerfully, and what particularly resonated with me, was the effect that others’ reactions have, on the individual with the illness. The question ‘Am I a fraud?’ is one that has plagued me for some time, and continues to play on repeat in my head, on a regular basis. So powerful is this voice, that it even pops up in my dreams. On one occasion, I’d dreamt that I was in the process of travelling to an appointment, and one moment I was in my car, and the next I was standing in front of a house. It felt incredibly frightening, because I had no recollection of how I had arrived there, and I remember having the thought, in my dream, ‘I wonder if I don’t remember, because I dissociated’. Immediately the voice retaliated with ‘you just want to believe you’ve experienced dissociation in order to reinforce your belief that you have BPD. You’re just making it up’. Those sorts of voices that many of us carry with us, are the ultimate invalidators, because we can’t just avoid them, or shut ourselves away from them – we have truly internalised them. They are often the offspring of real-life human invalidating influences in our pasts (or presents). It is well recognised that growing up in an invalidating atmosphere, where one’s thoughts and feelings are constantly being belittled or ignored, is a key environmental risk factor for the development of BPD. (Of course the causes of BPD are many and varied and the inter-play of contributing factors, both genetic and environmental, can be very complex, and is not well understood. However, for those who do go on to develop BPD, one can often trace a prior climate of invalidation). Because of this history, many people with BPD are acutely sensitive to invalidation, whether perceived or actual. The sense that my feelings are being invalidated is a powerful trigger for me, and can result, depending on the situation, in acute distress, anger, feeling uncared for, or wanting to hurt myself. Feeling invalidated and worrying about potential invalidating reactions from others, is one of the key reasons why it took me so long to tell a few key people in my life, about my diagnosis. The voice inside my head, telling me I was a fraud, was so powerful and created so much doubt within me, that I couldn’t see why other people wouldn’t agree with that voice as well. I have found it incredibly hard to accept my diagnosis – not because I found it shocking or disturbing, though I know this is the case for some – but simply because it is so hard to keep believing it to be true in the face of internal accusations and self-doubt. Even the fact that my husband thinks that ‘Stop walking on eggshells’ could have been written about me, simply reinforces, as far as ‘the voice’ inside my head is concerned, what a good job I have done of convincing myself and others of a lie. In my own case, the ongoing sense of invalidation was exacerbated by the circumstances surrounding my diagnosis. A little while ago, I formed one of those very strong, quite obsessional attachments, that for me has been one of the hallmarks of my BPD. Having spent most of my life telling no one about my mental health difficulties, I decided to confide in one of my closest friends, who herself has severe mental health difficulties. Typically for me, it had to be an ‘all or nothing’ approach, and the process of completely ‘unburdening’ myself drew me in, and before I’d realised what was happening, I found myself on the roller-coaster ride of BPD attachment and the idealisation/devaluation cycle. ‘Identity disturbance/an unstable sense of self’ is one of the key diagnostic criteria for BPD, and one of the implications of this is that people with BPD often mould to their environment and take on the characteristics or tastes of other people, particularly when they are in a relationship with someone. They attempt to take on another’s identity, in the absence of a solid and determinate identity of their own. This has certainly been true of me in the past. When your partner is into opera, or hill-walking, or is a writer or a musician, that may not be too much of a problem. But when the object of your obsession has BPD, you’ve just handed your ‘critical inner voice’ the perfect weapon and means of invalidation. My ‘critical voice’ took advantage of the fact that I was desperate to get closer to my friend, and accused me of ‘bringing BPD on myself’, or ‘pretending I had the symptoms’ in order to achieve this aim. Never mind the fact that this was a circular argument in any case, as the obsessional desire to get closer and the taking on of another’s identity, were themselves symptoms of the condition! Invalidation, or perceived invalidation, can take many forms. Sometimes, and with some people, I experience it as a lack of respect or acceptance of my views or feelings, or a sense that I’m not ‘allowed’ to have a different viewpoint – that I’m expected to be an extension of someone else, and conform to their expectations. This is particularly true for me, when it comes to my relationship with my parents. On other occasions, and with other individuals, I experience it as the sense that there is no point in putting an alternative viewpoint across in a debate or a discussion, as the other person will simply keep coming back with a counter-argument in an attempt to get me to agree with them, and this sets off another significant BPD trigger for me – the sense and fear of being controlled. Sometimes, almost anything that isn’t complete agreement with, or assent to, what I am doing or asserting, will be construed as invalidation. I am far from coming to a realisation or understanding about how to address these issues of invalidation, and they continue to be daily struggles for me. For a time, the ‘inner critical voice’ rose up less frequently and was less intrusive, and, at least as far as my diagnosis was concerned, it seemed as though I was coming to a very gradual acceptance of its reality – I was starting to ‘let myself off the hook’. This was a time in which I was in therapy with someone who I felt truly understood me, accepted me, and cared for me. She understood how I struggled with the sense of ‘being a fraud’, and every now and then – not too often, but often enough – she would indicate that she could see how my behaviour or my feelings made sense in the context of my diagnosis. I don’t know if she would have done this anyway – I felt that she did it because she recognised what a difference it made to me – but it was incredibly validating. Her acceptance of my diagnosis and what I was going through was the one thing, more than anything else, that had an impact on the ‘critical voice’, on my sense of invalidation, and on the degree to which I felt I could ‘accept myself’. The progress I made during that therapy, in that one respect, was one of the yardsticks by which I measured its success and the ”fit’ that I had with my therapist. It brought me a greater degree of peace, a greater sense of acceptance – it helped me validate me, which at the end of the day, is where one’s sense of validation, ultimately, needs to come from. It was as if, held by that most intense and intimate of bonds between therapist and client, I was able to finally face my inner accuser, stand accused of fraud, hear the charge against me and say, with belief rather than self-doubt – not guilty…..NOT GUILTY. Categories: Aspects of BPD, Sensitivity and invalidation | Tags: borderline personality disorder, BPD, fraud, invalidating feelings, invalidation, mental health, therapeutic relationship, therapy | Permalink. It was with completely unexpected pleasure and excitement that I re-found a copy of Susan Hill’s ‘Howard’s End is on the Landing’ on the bookshelf this morning, as I was about to dash out of the door to the hairdressers. I was looking for a ‘back-up’ book, in case my tablet malfunctioned (not an unusual occurrence) and I was unable to access one of the many half-read books on it. I knew there were a couple of weighty Ken Follett tomes somewhere, and apart from the challenges of fitting one in my handbag, I wasn’t particularly taken with the idea of starting something I wasn’t likely to finish for the next year. So finding the slim and enticingly entitled Susan Hill (which I had forgotten I had received for Christmas) was the perfect start to my long-awaited annual three-hour session to have my full head of highlights done. (Three hours? I have long hair). It’s hard to describe the way in which I look forward to my annual trip to have my hair done. It’s not vanity, though I do enjoy the way my hair looks good for all of a day or so while the shape that’s been blow-dried into it is still there, and while the colours are still vibrant and before they fade into my very dark natural shades. I have small children, and borderline personality disorder. The first is common to many, who will immediately understand why three hours out, just sitting, drinking coffee, and reading a book, is a pure luxury. The second is not quite so common, and you can’t take time out of it, but if you know, you’ll understand the value of getting away with your thoughts, and getting some space from your triggers. And of doing something that helps you to feel cared for, even if you are the one having to do it, for you. There’s a particular type of book I look for on these occasions, but it’s difficult to articulate what that is. I just know it when I find it. Past highlights (what a very poor attempt at a pun) have included Bill Bryson’s wonderful biography of Shakespeare and Jon Ronson’s ‘The Psychopath Test’. My books for these trips must be not-too-long, so that I can read a sizeable portion while I’m actually there, and can truly immerse myself in them and have them take me over. For me, there’s no better way to read a book, than in one sitting. They must be interesting page turners, and something I may not normally have thought of reading. I’m not particularly interested in Shakespeare, and ‘The Psychopath Test’ was something my husband was given for his birthday. But the writers of both books carried me along on a fascinating and funny journey, which I look forward to reliving when I pick up the books again in a few years time. On this occasion, I had imagined that I would be flitting between the various partially-read books on my tablet, including a Jodi Picoult and an interesting volume entitled’ The Buddha and the Borderline’. Deborah Meaden’s book, ‘Common sense rules’ was also on there and would have qualified as a ‘highlights’ book, had I not already been half-way through it, and so the excitement of opening the pages, starting out afresh, and finding out what it had to hold, was already in the past, and my reading of it had already become very fragmented. I was already feeling the disappointment of not being able to make the best use of the upcoming precious reading time, when my hand brushed over ‘Howard’s End is on the landing’, while I my eye was looking for ‘The Pillars of the Earth’. Susan Hill has been one of my favourite authors since I fell in love with “Strange Meeting” as a teenager. Some of my most vivid memories are of intense feelings felt as a result of reading a book, or reading a poem, or watching a film. ‘Strange Meeting’, and the central relationship within its pages, triggered that intensity for me. More recently, I have greatly enjoyed her crime novels, and it was in looking on Amazon to see if she had published another, that I came across this particular offering. ‘Howards End is on the landing: A year of reading from home’, is an autobiographical tour through Susan Hill’s personal library – a memoir hung on books, using her discovery and rediscovery of her collection to tell of the stories and memories they evoked. I’m not surprised that I loved it from the very first sentence. It was interesting, it was funny, it was warm, it was honest, it was beautifully written, and intimately revealing of its author. What surprised me, is that I read it with tears barely held back and lingering constantly just below the surface. What surprised me is that reading it was filled with poignancy and pain, and although the first was at least to some degree present in the book, the second was mostly present within me. How could a book that some reviewers called ‘light-hearted’, evoke such sadness? I think it was the ‘looking back’. I think it was the idea of a full-life, long-lived; the idea of being able to pick memories off a book shelf, that could be pondered with contentment, and made sense of in the context of a coherent life, true to some underlying core. Those things, in themselves, are the very opposite of sad – but they are things that I find it impossible to believe can be true of me either now or in the future, and that is where my sadness lies. It also lies, very much so, in the resonances that ‘looking back’ has for me at the moment. I have been doing a great deal of ‘looking back’ – in therapy, and outside it. It’s a painful process, and I know there’s much worse to come. The key Pandora’s boxes have been skilfully avoided – my grief over having to cease therapy with my previous counsellor being a very genuine, but also very convenient, distraction from those things that I would rather not talk about. Though it’s all leading to the same place in the end – grief is loss, and loss is everywhere. It bubbled up occasionally in Susan Hill’s accounts of authors that she knew, but it bubbled up continually as I was reading, in my sense that ‘the past’ is defined by what I have lost or never had, and that ‘the future’ is defined by the losses to come. What should have joined the two, a stable thread of enduring identity, is shaky at best. When I hold up a mirror to the past, or try to look into a crystal ball, what I see depends entirely on who I was mirroring at the time, or who I am longing to ‘merge’ with now. The ‘therapy-honed’ eye of self-awareness picked up on it even as I was reading – the more I lost myself in the text, the more attracted and the closer I felt to its author. Its author who, like many of those who I have felt drawn to recently, is an older woman. Yet another source of sadness. Yet another closed box waiting to be opened. The time passed all too quickly. I had read half of the book, and knew that the other half would probably have to be read in toddler-attention-span-sized chunks, or far too late at night when I knew I should be sleeping. I had beautiful hair – I’d been well looked after. When I got home no one commented, and I tried not to feel too hurt. Another borderline day – but with a difference. I wonder what my memories of this day will be, when I ‘re-discover’ the book in two, five, ten, twenty years from now? Will the actual memory be, as the prospective memory was, laden with sadness? Maybe. But I hope that I will remember that this was a day when I was able to conceive of a future; that an existence beyond the immediate chaos made sense and held, if not promise, at least possibilities. And that’s a little way further on than where I have been in the past. Categories: Abandonment and loss, Aspects of BPD | Tags: Bordeline personality disorder, BPD, grief, identity, loss, mental health, therapy | Permalink.